The game was made for LudumDare #33 as a Jam entry. A team of three with less than 72 hours, Jeremy “mmango” Bell doing audio, Daniel “MechanicalLife” Akesson doing visuals and myself doing the programming. Theme was announced, You Are The Monster, and the team got busy brainstorming ideas, after a few initial rejections and combining a few elements we had the idea to do a not so endless running game with jumping and sliding mechanics. The small scope would allow us to get the game playable quickly, and we knew the challenge was going to be portraying the story/mood behind the game without a giant wall of text. After design we all essentially went for the first round of sleep with little work. Having just arrived back home from a business trip, an hour before theme was announced, I was quite tired and ended up over sleeping in the morning slightly. I brushed it off, threw some food down the hatch and got to work. Playable in 4 hours with win and lose… or not. My development pace was actually much slower than expected. Daniel and Jeremy were doing great tossing the art and sounds in the source control repository, but I was operating about 25% the speed I would have expected of myself. 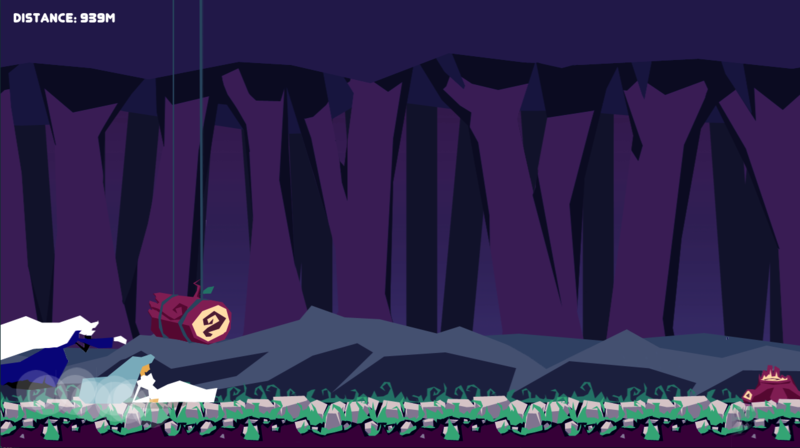 Got the background in with the parallax effect first, then the player running, jumping and sliding over some very fake obstacles. Tweaked this for a few hours until it felt good. Hacked in a very crude crossfade effect for the music from title to gameplay. The real obstacles started coming in from Daniel and soon after were added in game, which I had to play with the collision bounds for each obstacle individually. The next day the shadow/ghost was added to chase the player, and some more tweaking to the game difficulty, how much tripping on an obstacle costs. Thanks to the others on the team, we were also able to find and remove some exploits that could have otherwise been used, like forever sliding through the level. Instead of fiddling with a random obstacle spawner, we decided to go with a designed level, so I implemented a very simple way to place obstacles by json ‘script’ and wrapping up the second full day we decided on a distance of 1000 meters and that the audio track could be custom length to fit. The final day I had to work, but was able to find a little time to add the win sequence and a much better lose sequence to the game. Didn’t have time to make the intro sequence better though as the death sequence was finished 5 minutes before time ended. Daniel took on the role of level designer for the most part, sacrificing a nice title image for our main screen as I was busy with the win/lose sequences and Jeremy busy on resizing the music track. The scope of the game was sized appropriately, had room to add polish effects. Flawless team work, communication and effort from everyone. TurtleBrains allowed rapid development of the game on Mac/Windows. Shorter level, 5 minutes was too much to fill with obstacles. Leave more time for level design and testing, it was too rushed and too hard. More animation iteration/polish, some didn’t read as desired. My personal development speed was slower than my own expectations. TurtleBrains OpenGL/OpenAL crash issues for Daniel, and other players. This entry was posted on Tuesday, September 1st, 2015 at 2:02 am and is filed under LudumDare, OneGameAMonth. You can follow any responses to this entry through the RSS 2.0 feed. Both comments and pings are currently closed.